Victoria ER is a freestanding emergency center that offers comprehensive care from illnesses to major trauma, even life-threatening conditions. Our facility is open 24/7, featuring concierge-level care in a comfortable, upscale environment with short wait times and faster results for diagnostic and lab tests. If you're like most emergency room patients you want shorter wait times, a comfortable waiting room, and board-certified physicians. At Victoria ER most patients are seen within 10 minutes, and given concierge level care. Victoria ER is open 24/7, including holidays, which makes it always conveniently available to patient needs. Kisses cannot heal all boo-boos, so Victoria ER is prepared to treat infant and child health emergencies too. 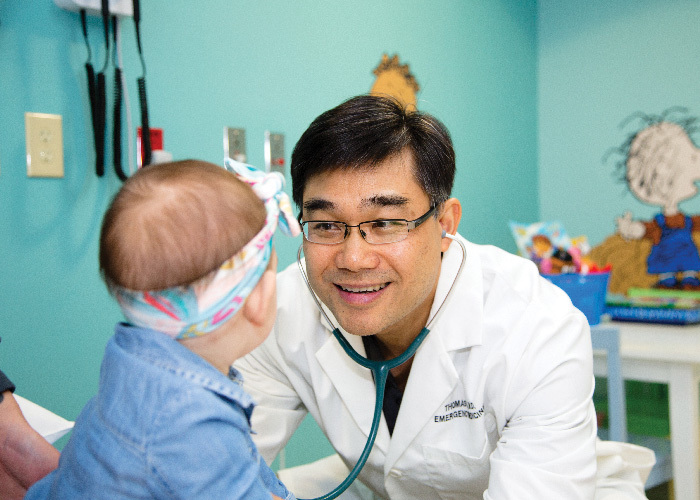 Our board-certified physicians and pediatric specialists are experienced in diagnosing and treating common, chronic, and acute illnesses for infants, toddlers, and children. "Very friendly and caring staff and very prompt service. I would recommend this place to anyone who needs immediate attention with people who truly care. Thank you for helping my son so quickly!" "Took my son here and we got in right away. All the nurses were nice and made us feel comfortable. The doctor was super friendly and explained everything to us. Definitely recommended!" "I came in the other night after feeling very ill and right away the staff was super friendly! They got me in and out quickly while still giving me the best quality care. They were very thorough when they went over the costs. Also, I loved how they called the next day to check up with me!" "I was very pleased with Victoria ER when my son required a couple staples from an injury. Staff was caring and professional. It is good to know there is an ER in my area I can trust!" Get to know Victoria ER from the inside with our virtual tour. Get a peek of our exam rooms, where we work to treat patients and make everyone feel right at home.